To become a Certified Registered Nurse Anesthetist (CRNA), you must be a registered nurse with a Bachelor of Science in Nursing (BSN). Before taking the licensing exam to become a Registered Nurse (RN), you must already have a BSN, which usually takes four years to complete. After earning a BSN, becoming an RN and enrolling in a CRNA program, you can expect to become certified in two to three years. The entire process takes most people seven to eight years to complete. The educational requirements take six to seven years, while the minimum acute care experience takes one year. This experience is required of all RNs before entering a CRNA program. Because many nursing programs follow a strict application process and course schedule, completing BSN and CRNA programs can take slightly longer than expected. What Does a Certified Registered Nurse Anesthetist Do? are ultimately in charge of administering anesthesia to all patients. As well as relieving pain associated with surgery, Certified Registered Nurse Anesthetists work closely with patients during childbirth, illness and treatment for trauma, managing dosage levels as needed. Before administering anesthesia, Certified Registered Nurse Anesthetists consult with patients to decide on the best method for anesthesia, explain the process and answer questions. Part of a CRNA’s job is to relieve the patient’s worries concerning anesthesia and discomfort during surgery. Due to the training and education requirements for CRNAs, these specialized nurse professionals work under a high level of autonomy and bear great responsibility. According to the American Association of Nurse Anesthetists, many studies show that CRNAs provide the same level of care as physicians with regard to administering anesthesia. After acquiring the necessary clinical experience, an Registered Nurse can enroll in a two to three-year CRNA program that consists of around 12 months of coursework and 12 to 21 months of clinical training. During the first phase of the program, lectures and exams focus on anesthetic pathophysiology, including how anesthesia is administered throughout the body and how the body responds to anesthetics. 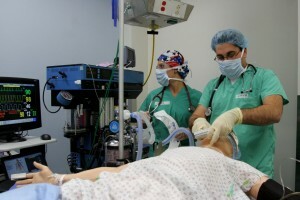 Students gain experience working with an anesthesia machine and learn the principles of airway management. The classroom phase is extremely challenging to most students because the pace is set very high and a 3.0 to 4.0 GPA is required, according to Minority Nurse’s website. Programs that include overlapping classroom and clinical instruction are especially demanding as they typically require weekly exams, attendance at lectures and clinical training at various times throughout the week. Training in a clinical setting involves day and night shifts as well as the possibility of travel. Certified Registered Nurse Anesthetists schools are selective and expect students to have a strong understanding of a CRNA’s duties before an admissions interview. Before interviewing, an Registered Nurse should spend some time following a CRNA in a clinical setting. With the stress and responsibility put on CRNAs, they earn a high level of respect and salaries ranging from $100,000 to $190,000 per year. Experienced Registered Nurses interested in an increased level of patient care and salary should take the steps to enroll in a Certified Registered Nurse Anesthetist program. With enough effort, meeting the requirements to become a certified registered nurse anesthetist is certainly attainable.